It was a perfect winters day, cold, clear and crisp, an excellent opportunity to think about how some of our feathered friends look after themselves when it gets colder. We made some fat balls for the birds that stay in England because there isn't so much food around for them. Then we walked through our woodland and the children chose where they wanted to hang the tasty treats. We looked for signs of winter and noticed that the grass was still, "White, scrunchy, and frosty' in the shade but the sunshine had melted the frost in other places and it had melted it so the grass was green again. The children pretended to be birds, shivering in the cold English winter, then taking flight and migrating to warm, sunny Africa! 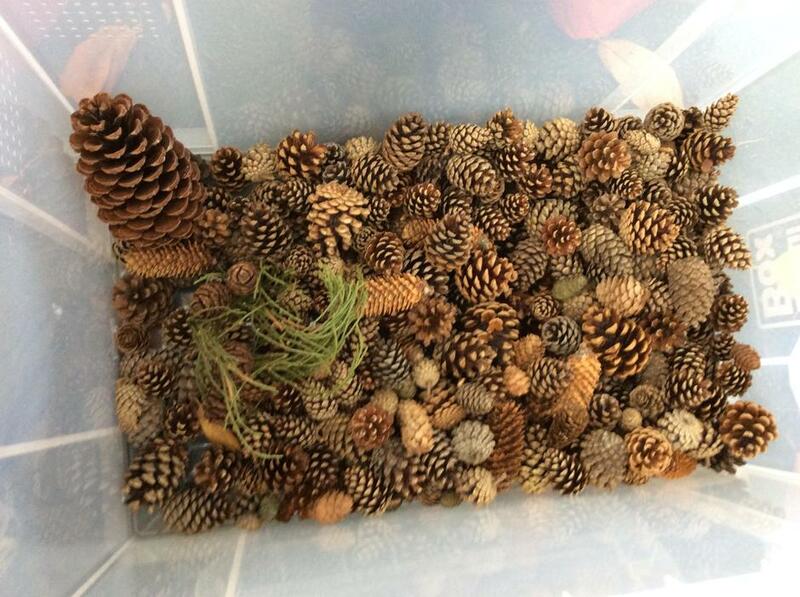 How many pine cones!?! Wow, thank you for collecting them for us. 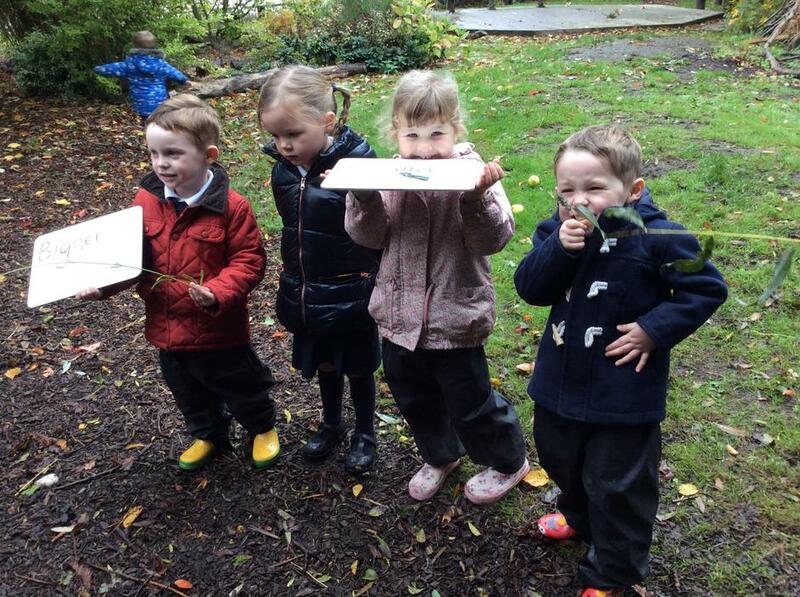 We had great fun counting them and recording how many we have. We decided that it was easier to count them out into groups of 5 and then put them in the box and add the groups of 5 together to get the running total. 330 so far and counting. 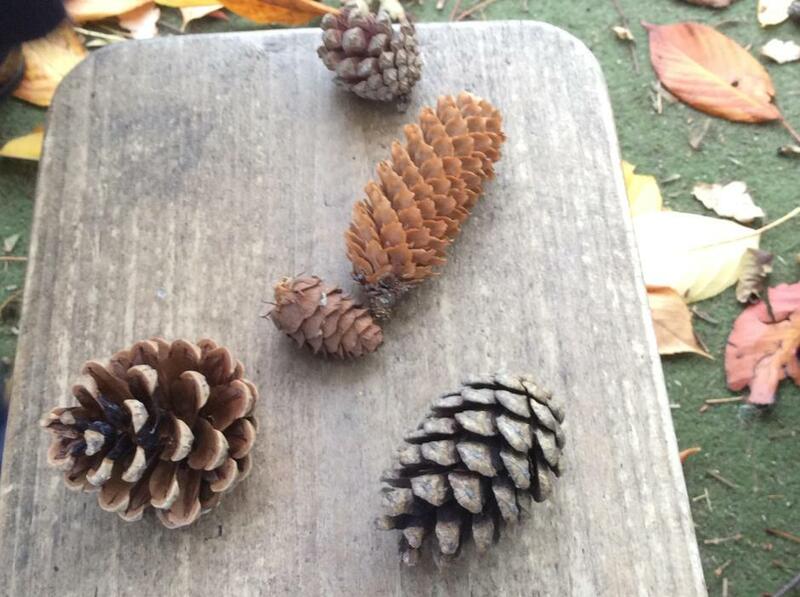 There were lots of different shapes, sizes and colours of pine cones, all very beautiful. 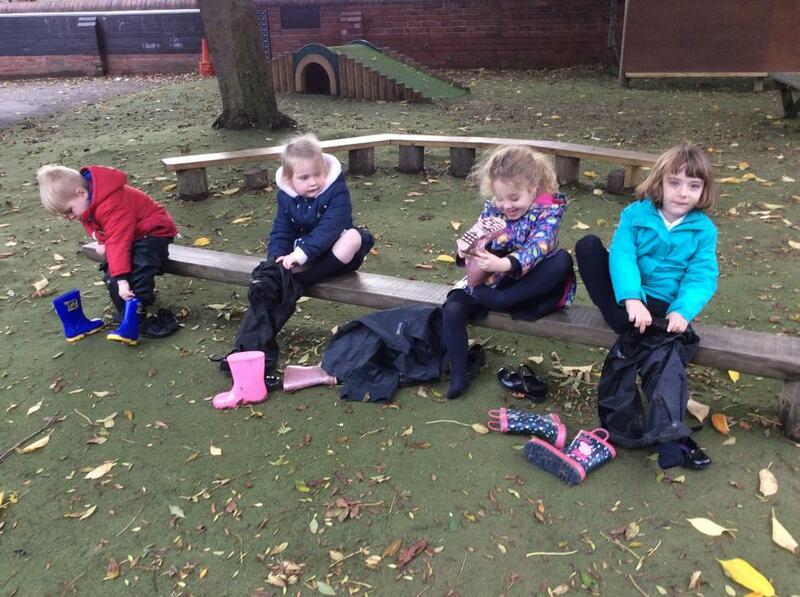 The children are getting so much better at preparing themselves for Outdoor Learning. 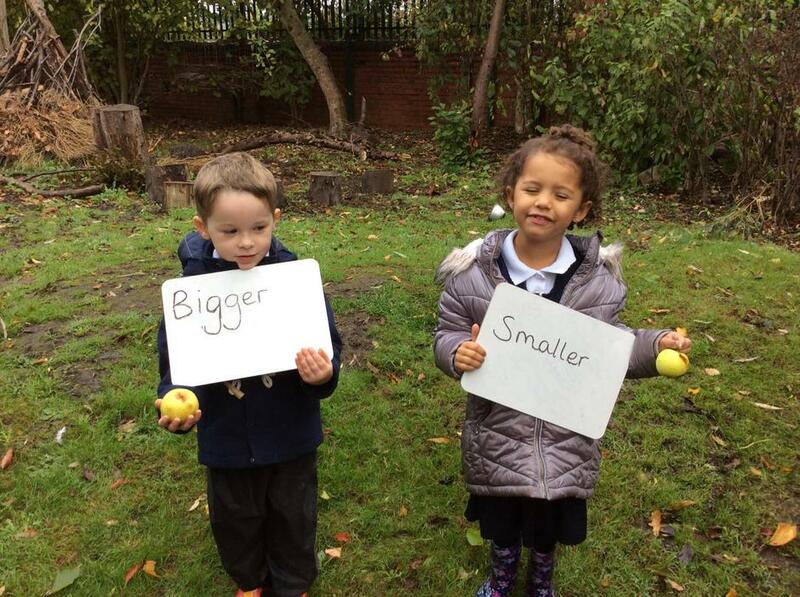 We were looking for bigger and smaller things today, the children explored the Wildlife Area and found lots of examples. On our way to the Wildlife Area we found some bigger and smaller puddles to jump in. 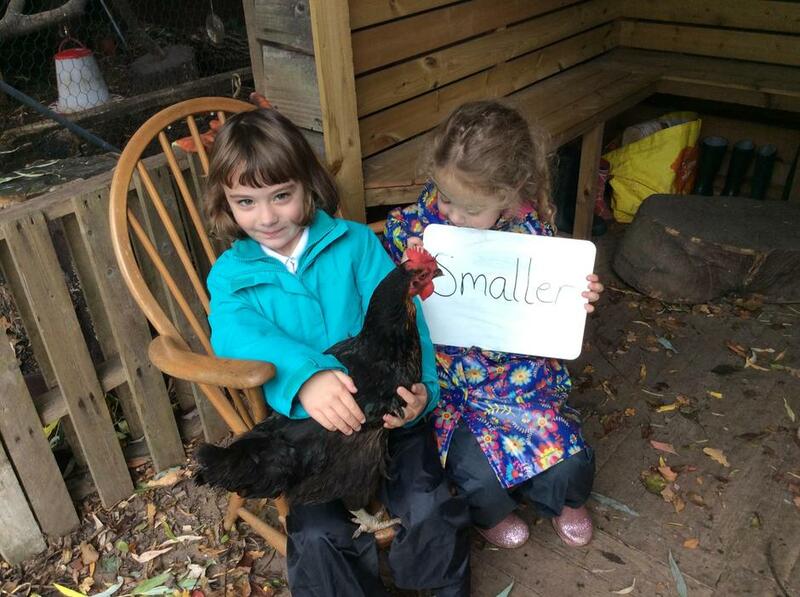 Some of the children practised making the sound ‘B’ for bigger and ‘S’ for smaller. We love trees 🌳. We have been speaking about how important they are for our world and how beautiful and inspiring they can be. The children have all chosen ‘their tree’. 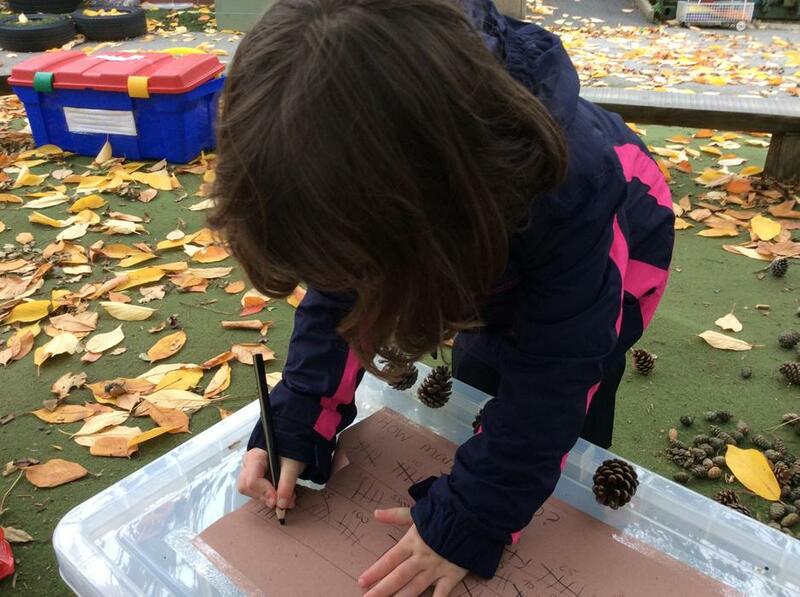 We went for a walk around our school and they were encouraged to slowly and quietly see which tree made them feel the nicest and which they felt a connection to; which was ‘their tree’. It was so beautiful to watch them really look, smell, touch and think about the trees. We will be watching them over the coming year to see any changes that might take place. 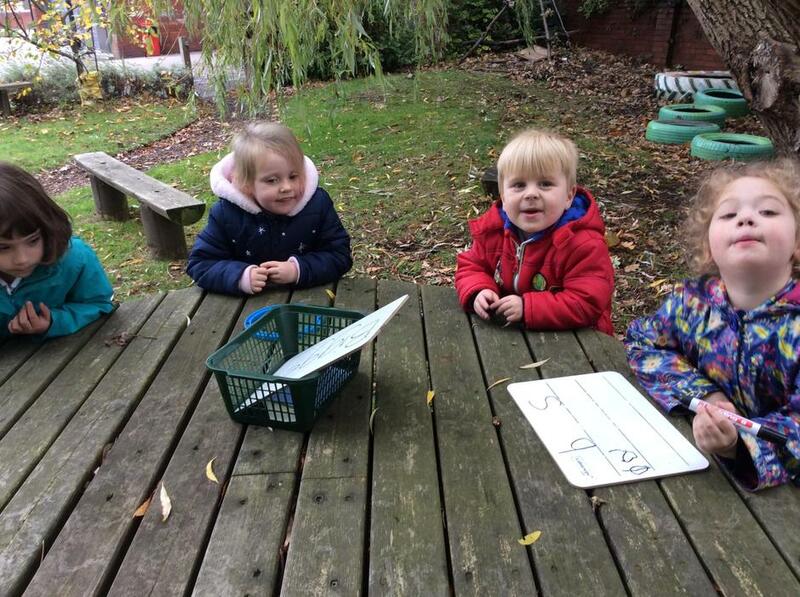 Lots of learning at Nursery happens outside. 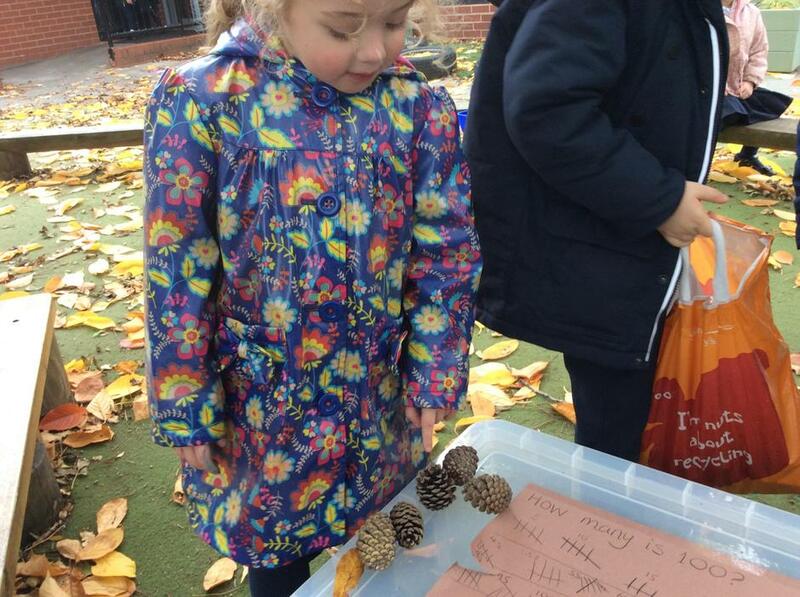 We have started to get ready for Forest School over the last couple of weeks, we will be outside for most of the session on Tuesday mornings so the children can really have the opportunity to increase their confidence, independence and resilience. They will develop their skills in assessing and managing appropriate risk and play and learn through direct experiences within nature. 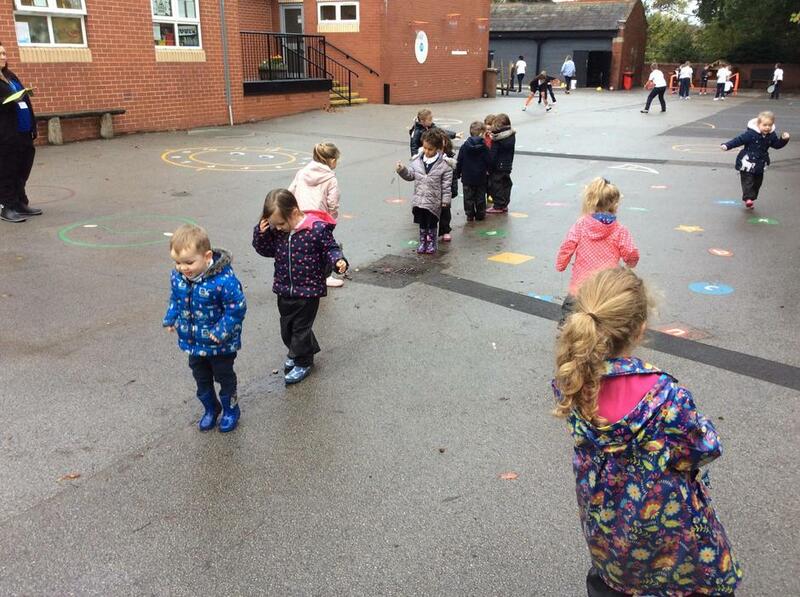 The children have been exploring the different outdoor areas around the school site. You can have a look at some of the things they have been doing here. Recognising animals and plants on the posters. Exploring the fire circle area. Newly planted ‘seedlings’ in our new polytunnel. The children made a discovery table. They pretended the willow dome was a jail! So many apples this year. Eagle eyes spotted a stripy spider. 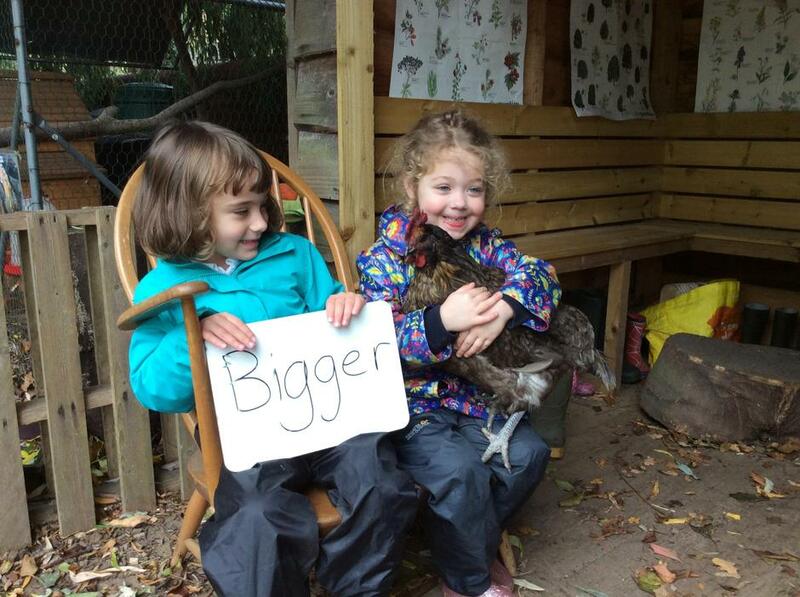 Just one egg from our chickens today. 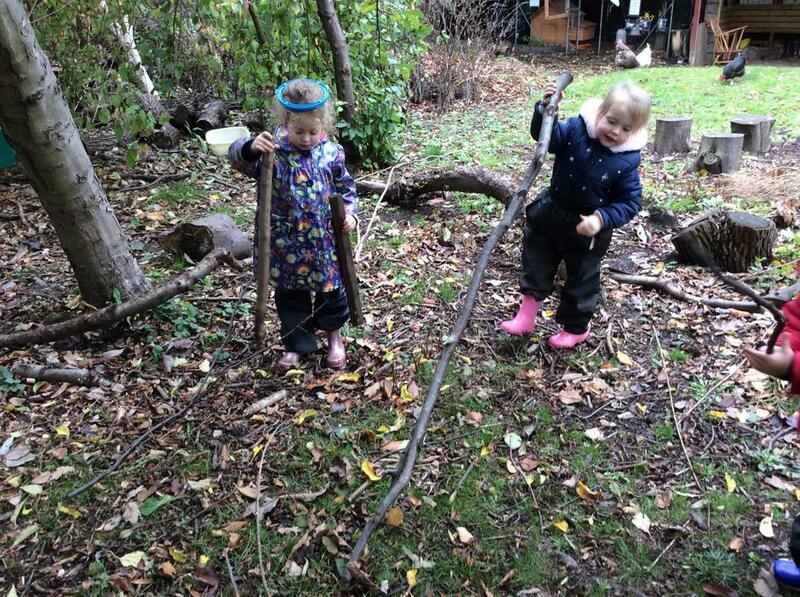 Collecting the right length of sticks. Weaving berries into our outdoor loom. We are taking part in the ‘Growing Our Own Potatoes’ scheme. We chitted them for two weeks then planted them in bags of compost. We have 2 varieties of potatoes from the company and one more from Mrs Waters. We made a Mr Potato Head label for the Rocket potatoes. 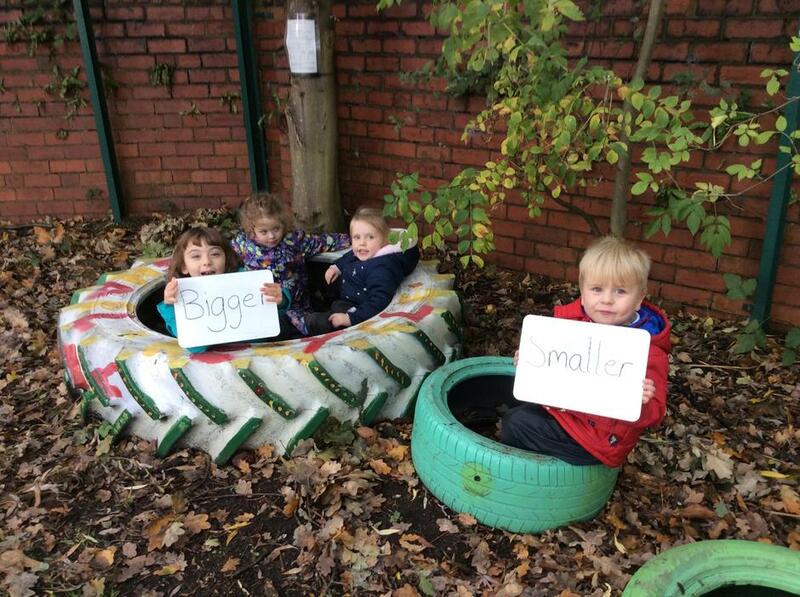 Watch this space to see how they grow. Potato tubers just want to grow. Taking our equipment to the allotment. Carefully planting our chitted potatoes. 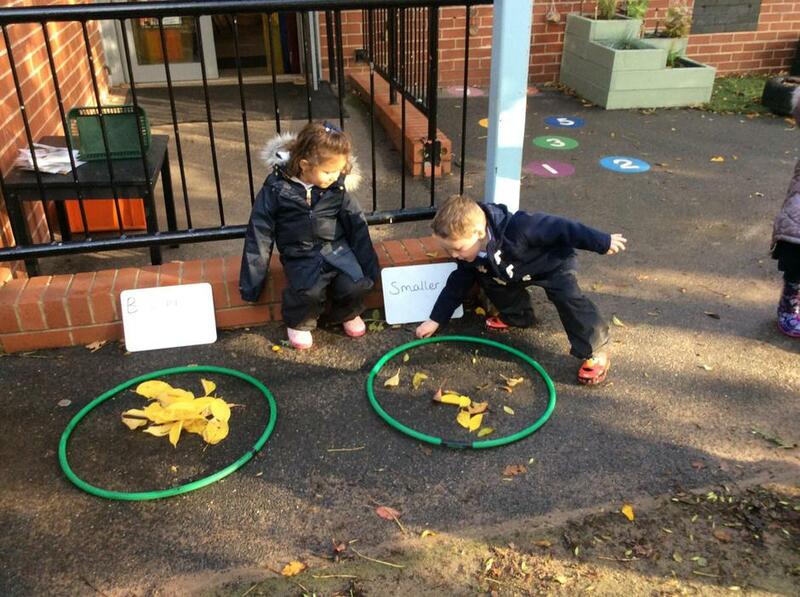 Much of the learning in early years take place outside. 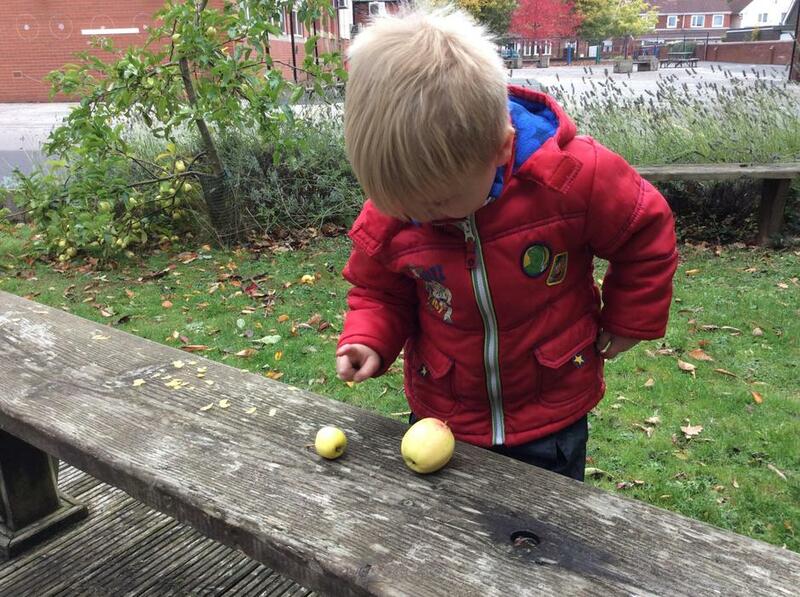 Have a look at some of the things we learn while being outside. 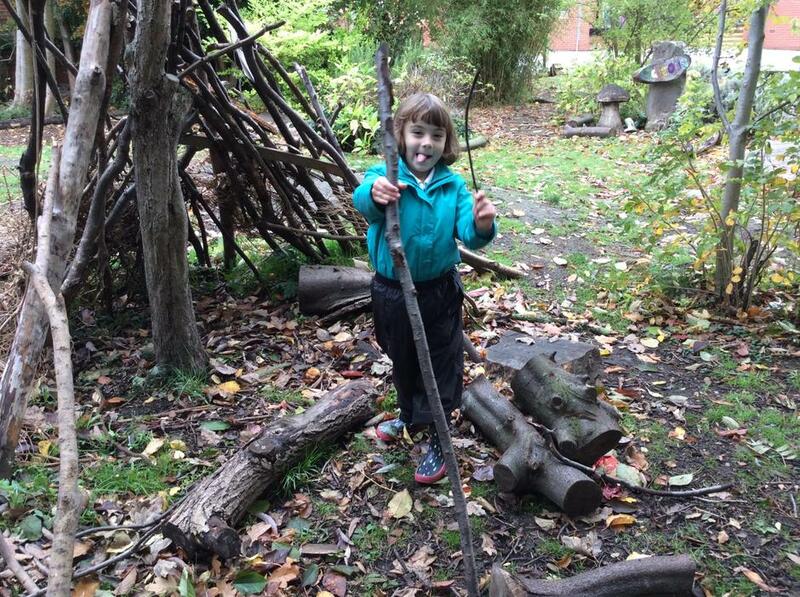 The Forest School activities can been seen by clicking on the Forest School icon. "Let's see if the frost melts in the sunshine." What does the newly chipped bark smell of? How old was this tree? Let's count. The hedgehog is still hibernating. "Lets make a spiders web out of sticks"
Examining the properties of frozen mud.